Craigslist is a great alternative platform to eBay when selling stuff. You avoid all those annoying fees that come with listing on eBay. From the initial listing fee to the final value fee, eBay can take some of the fun out of selling on-line. And isn't it a great feeling when you're handed cash by a buyer knowing you actually get to keep every penny of it? But there is one big annoying drawback...Craigslist buyers can't commit! Trying to get one of these prospective buyers to commit is a little like wrestling with a greased pig...it's frustrating! If you sell on Craigslist, I bet you know exactly what I mean. Part of the problem is that unlike eBay, a Craigslist buyer isn't locked in after they've committed to buying. With eBay, once you win an auction you pretty much have to pay or you'll face big trouble. An eBay buyer who backs out of a deal is subject to a string of automated e-mails from eBay and the threat of possible removal. But not so on Craigslist. It's a frustrating commitment-free zone where anything goes. Buyers can send you e-mails for days and weeks running you around. Bottom line is that you never know until the buyer pulls up to your house if you're getting paid. Take for example these ceramic tiles I recently sold on Craigslist. They were left over from a home improvement project in my house. 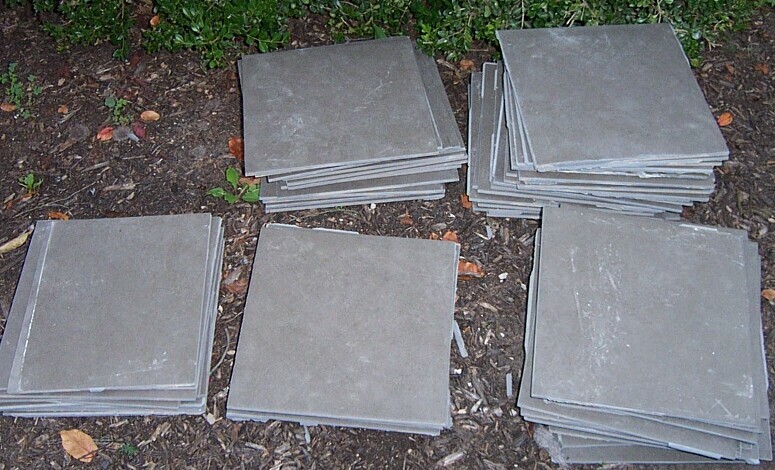 I listed all seventy tiles for $50 bucks-less then half what I paid for them at Home Depot. I received a huge amount of inquiries, many assuring me they would be right over to pick them up. But I was like the proverbial bride left at the alter...no one ever showed! Having no sale, I started to think I would be stuck using them to tile the dog house! Finally, after about five no-shows, a husband and wife showed up at my house and paid me my asking price. This isn't uncommon with a Craigslist sale. Knowing Craigslist buyers can be illusive, I've developed a few strategies to try to reel them in. It starts with the inevitable e-mail that asks, "Do you still have them for sale? (I think this is a dumb question. I have them on Craigslist right? Well then, they're still for sale!) When I get the initial inquiry, I respond with a quick, " Yes, when do you want to pick them up?" This is a variation of the old salesman trick when they ask, "How many can I put you down for?" By asking them this, I am trying to cause them to commit right away. Sometimes this question scares them off. But if it does, they probably weren't going to buy anyway. Making it convenient and easy to pick up is another good tactic. I'll inform the buyer that I'll meet them at a location close to their home. Occasionally when trying to land a really big dollar sale, I'll even offer to deliver the item right to their home. This can really grease the deal since the seller doesn't have to lift a finger. (Other then pulling the bills from his wallet!) I once sold an Apple computer to a private music teacher and drove the computer to his studio. While he was in another room giving a music lesson, I set the computer up for him like a tech support geek! After finishing his lesson, the teacher came out to the reception area and was tickled pink when he saw the computer up and running! Transporting the computer right to the teacher's place of business sealed the deal for me. Lastly, I'll utilize a little psychological warfare on some prospective Craigslist buyers. When responding to e-mail inquiries, I 'll sometimes bluff and say that someone else may be coming over to buy it. I then tell the indecisive buyer that I'll sell it to whoever shows up first. Sort of the old "first come/first serve" rule, only there's no one else actually coming over. But by suggesting an imaginary competitor, I am trying to create a sense of urgency in the mind of the buyer. Hopefully this will motivate the indecisive buyer to jump on the deal. There is an overlooked fringe benefit to working in the garage sale industry. You may never have thought about this, but when you buy toys and electronics, a hidden bonus is inside just for you...batteries! Free batteries come with the territory and save you money over the long run. Of course, sometimes you'll buy a toy and the batteries are dead or corroded with acid. That's never a good thing. However, more often then not when I buy a toy the batteries are usually still good. The reason for this? Probably little Johnny hardly played with the toy, so the batteries stayed fresh. Prior to selling it, I always pop out and check toy batteries with a tester. 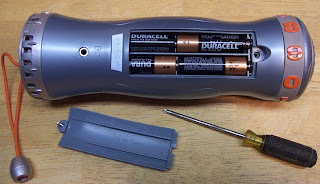 If the batteries are good, I don't put them back in the toy, I store them away for future use in my TV remotes, garage door opener and other stuff. Check out this picture of a Leapfrog Educational toy I recently bought for one dollar. When I opened up the battery compartment, I found not one...not two...not three....but four fresh AA batteries! While it may not seem like a big deal, let's do some math. I paid one dollar for a toy which contained four AA batteries. Think about what a four pack of AA batteries costs you at your local big box store. I'd say around $3.00 dollars right? So in reality, the dollar I spent for the toy comes right back to me because I am saving on the cost of batteries. Or look at it another way; I paid one dollar for a pack of (4) AA batteries and got a free toy with the deal! A little round-about logic but still true! So just consider free batteries a fringe benefit to the job. Have you found some other garage sale fringe benefits like free batteries? If so, give me a shout and I'll pass it along! We talked a few weeks ago about the benefits of toy recalls. One of the more newsworthy recalls was the Thomas the Tank Engine lead paint fiasco. In that notorious screw-up, some wooden Thomas the Tank Engine toy trains were found to contain lead based paint. Primarily it involved Thomas wood train pieces made in China that were painted red. The recall program has been in place for a couple years and has been a buying opportunity for folks like you and me. Many of these toys can be had at garage sales for a dollar or less per train. Best of all, you're not just buying toxic trains to make some quick bucks. Heck no, you're like a comic book super hero coming to the rescue of little kids! When you buy these dangerous lead based toys, you're helping to get this toxic junk out of the hands of innocent children. Did you ever think you could do a "good deed" at a garage sale while making money at the same time? You absolutely can...so go out and do lots and lots of good deeds! As a cautionary note, I am not certain how much longer this program will be in place. 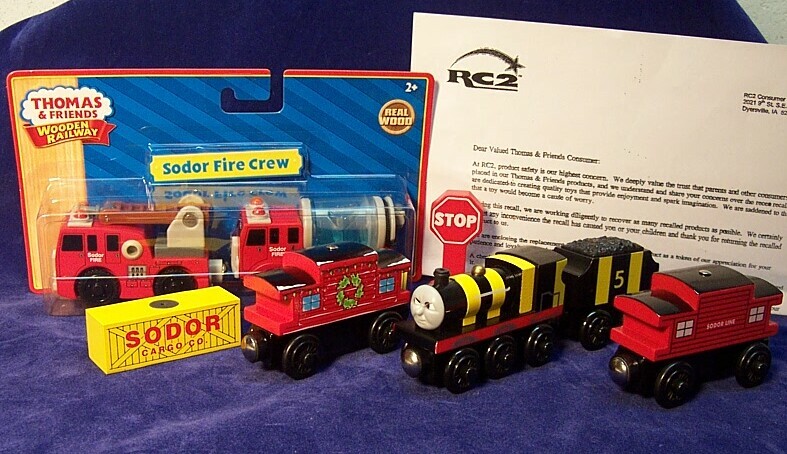 I've learned that Tomy Corporation, a huge Japanese toy conglomerate just took over RC2. Now when you attempt to go to the RC2 company website, it immediately reroutes you to Tomy.com. But until the Tomy corporation shuts down the recall program you can be the "Toxic Avenger" super hero, removing dangerous toys off the street while making money at the same time! Do you know any other toys recalls we all should be looking for? If so, let me know in the comments section or send me your story for the website. Happy Hunting!